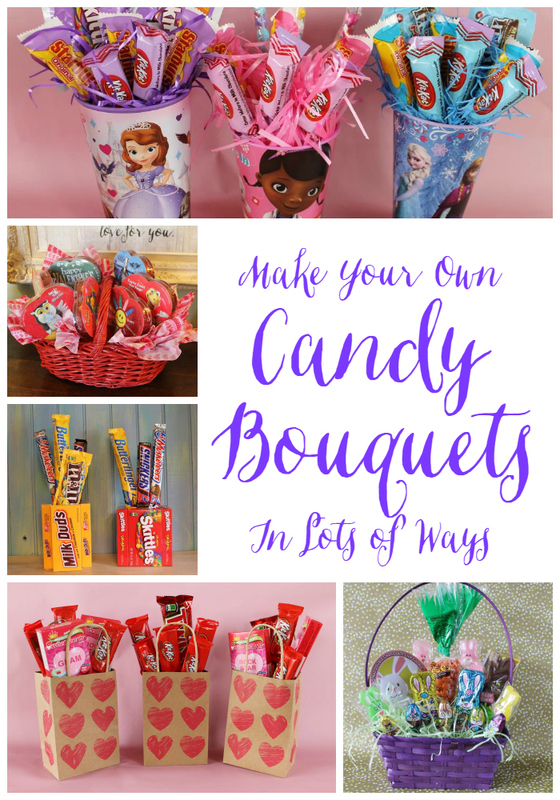 candy is to use a basket as the base for your candy bouquet. you will need to fill it up to make it look generous. candies upright. Cut the foam to fit snugly in the basket. $3-$4 per can and goes a long way. product. It can be tricky to use but is inexpensive. you are interested in finding out more info. this post...it is the spray foam experiment in basket filling. 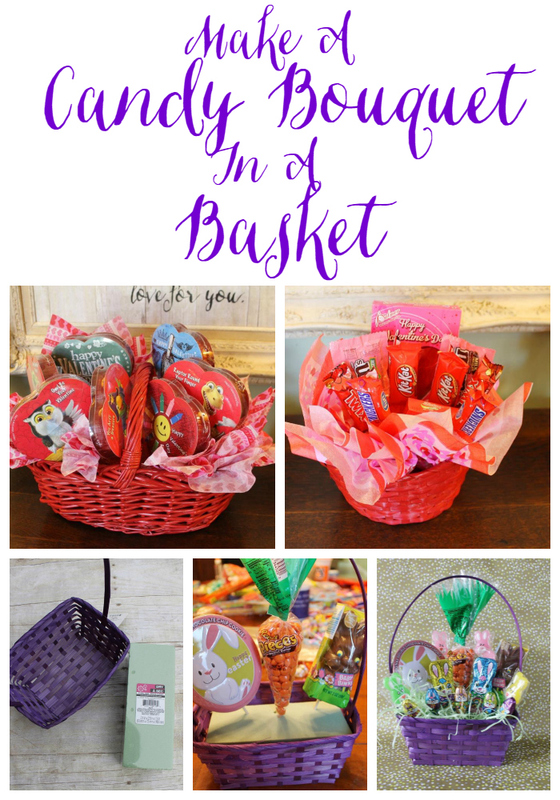 The round basket came from the Dollar Tree. The oval basket came from a yard sale. Each was $1. candy bouquets, I spray painted them red. of grocery stores usually) on the backs of the candy. On large candy like these heart-shaped boxes, you can use clear shipping tape. Several rows of horizontal regular clear tape also works if you don't have the wider tape. For smaller candies, you can use smaller skewers. the flap. Tape the skew down with clear tape. Then pull the flap over the skewer and tape it again. For health reasons, only used wrapped candy in candy bouquets. Large candy bars need larger skewers to hold them up. They can be taped in the same way. With flap pulled up, tape the skewer beside the fold. Then pull the flap over the skewer and tape it down, hiding the skewer. yard hand clippers. It's like snipping a twig. Easier than scissors. just use the more colorful layer. upwards. Insert the napkin in between the basket and foam. pop off of the skewer if you push on the candy part. This is the Dollar Tree basket with mostly miniature candies. The photo above and below is the yard sale basket with $1 boxes of candy inserted. A few additional napkin "fluffs" were added within the candy to hide the foam. Click on "Decorative Fillers For Candy Bouquets"
fix for that...put the candy up on skewers! it makes the basket tip over. Tape candy onto skewers. Push the skewers into the foam. Add smaller items in the front. The lollipop bouquet ($1 at WalMart) was opened and bunnies already on sticks inserted also. Add Easter grass to cover the foam. "theme" required...just lots of candy!